The Perfect Jane Austen Teacup Cupcakes! … and indeed we do! Preheat the oven to 190 degrees. Cream together the sugar and the butter until smooth. Beat the egg and then add it to the sugar/butter mixture a little at a time. Stir in the sifted flour and vanilla essence. Grease the teacup insides and place onto a baking tray. Divide the mixture evenly between the four teacups. Bake for between 15-20 minutes or until the cakes look golden brown. Wait until cool and then decorate! Add 5ml (one teaspoon) of instant coffee, dissolved in hot water, to the cake mixture along with the flour and instead of the vanilla essence. We’d love to see how you get on! Feel free to email photographs of your creations to us at austensocialmedia@gmail.com, or message us on Facebook or Twitter! When Jane Austen wrote to her sister Cassandra of the holiday visits they enjoyed (endured?) in 1808, she included a delightful word picture of one of their guests. As the letter is dated Tuesday, December 27, we can assume that Christmas was the previous Sunday and the visit occurred on December 22. It gives a glimpse into the Austen’s dining and entertaining menu while they lived in the Castle Square neighborhood of Southampton, before moving to Chawton Cottage in Hampshire, the following July. Our evening party on Thursday produced nothing more remarkable than Miss Murden’s coming too, though she had declined it absolutely in the morning, and sitting very ungracious and very silent with us from seven o’clock till half after eleven, for so late was it, owing to the chairmen, before we got rid of them. The last hour, spent in yawning and shivering in a wide circle round the fire, was dull enough, but the tray had admirable success. The widgeon and the preserved ginger were as delicious as one could wish. But as to our black butter, do not decoy anybody to Southampton by such a lure, for it is all gone. The first pot was opened when Frank and Mary were here, and proved not at all what it ought to be; it was neither solid nor entirely sweet, and on seeing it Eliza remembered that Miss Austen had said she did not think it had been boiled enough. It was made, you know, when we were absent. Such being the event of the first pot, I would not save the second, and we therefore ate it in unpretending privacy; and though not what it ought to be, part of it was very good. One of the joys of April is the appearance of green and growing gardens after the chill of winter. In her quintessential guide to English cooking, The Art of Cookery Made Plain and Easy, Hannah Glasse offers a round of up all the dainties one might expect to harvest this month. She does not offer hopes that one has a garden or tips for growing the garden of fine herbes — these are already assumed– she merely states what might be found in the garden. Estates and even cottages relied on their gardens for fresh produce throughout the year and the lack of a garden was one annoyance of city living. In her book, The Art of Cookery Made Plain and Easy, Hannah Glasse offers an overview of the kitchen garden, month by month. The following recipe is shared, courtesy of Pen Vogler, from her recent book, Dinner with Mr. Darcy, via our online gift shop. Check out this amazing cookbook (with it’s mouthwatering photographs!) for many more Regency era recipes. Is it easier or harder to write if you’re also responsible for feeding and looking after your family? “Composition seems to me impossible, with a head full of joints of mutton and doses of rhubarb,” Jane Austen wrote to her sister Cassandra in September 1816, after a period in which she managed the household at Chawton Cottage in Cassandra’s absence. Fortunately for Jane – and for us, as readers of her fiction – most of the time it was Cassandra who filled this role, freeing Jane to write. In her writing, she doesn’t mention food very often, yet Maggie Lane’s book Jane Austen and Food shows her references to it are significant because “she uses it to define character and illustrate moral worth.” Jane Austen and Food was first published in 1995 by The Hambledon Press, and it’s newly available as an inexpensive e-book from Endeavour Press. It isn’t a cookbook, but a discussion of food in Austen’s letters and fiction. I’ve always loved that line from her letters about composition, and reading Jane Austen and Food helped me understand it better. I learned that “mutton” isn’t always just mutton, and that “rhubarb” isn’t what I think of as rhubarb. Mutton, says Lane, “seems to have become the generic word for meat – or for dinner itself.” She cites the example from Mansfield Park of Dr. Grant inviting Edmund Bertram “‘to eat his mutton with him the next day,’ without supposing, for a moment, that ‘the bill of fare’ as he calls it is actually mutton (in fact it’s turkey).” The rhubarb Austen refers to is “not the plant we think of, the stalks of which are eaten as fruit,” but “the medicinal rootstock of the species of rheum grown in China and Tibet,” imported in powdered form to be “used as a purgative by the overfed part of the population.” Lane points out that in Northanger Abbey, Catherine Morland eventually realizes poisons are not as readily available as doses of rhubarb. Jane Austen and Food begins with a discussion of “domestic economy” in Austen’s life and letters, outlining the historical context for subsequent analysis of meals, menus, manners, and morals in her novels. The book is full of entertaining facts, including the Austen family’s choice of turkey at Christmas (they reared their own turkeys at Steventon) while many other families ate beef; Jane Austen’s preference for the term “garden stuff,” instead of “vegetable,” a word she didn’t use in her writing until Sanditon in 1817; the rare appearance of similes in her work (“as White as a Whipt Syllabub” and “as cool as a cream-cheese” are both in Lesley Castle); and the importance of the hour at which a family had dinner. Who has control over food is also a key question in the novels, and Lane’s analysis is fascinating. We can learn a great deal, she says, about General Tilney and Dr. Grant from their obsessive focus on the quantity and quality of their food. While the former is “active and officious” and the latter is “idle,” Austen “shows how apparently very different styles of men can use food to manipulate and tyrannise over their immediate family.” Even characters with little or no control over the type of food or the time or place it is served find ways to exert control. Marianne Dashwood, Fanny Price, and Jane Fairfax all reject food at times of intense emotional distress. Lane writes that “the eating disorders of Marianne, Fanny and Jane may thus be said to mirror a degree of social disorder.” In contrast, Austen’s other heroines are indifferent to food. They “eat to keep themselves healthy, to be sociable, to conform. But not one of them ever anticipates or expresses pleasure in a meal, or admits to liking a particular food.” Whether a character is eating or not eating, talking about food or not talking about it, Austen’s choices are always telling. The book concludes with not one but two interpretations of Emma, a novel “so replete with food that it requires a whole chapter to itself,” and a helpful index of food and drink in the novels, so you can look up references to cherries, chicken, and chocolate, for example, or parsnips, partridges, and pineapples. Food and housekeeping may be considered “mundane” by some, as Lane says in her introduction, but her excellent analysis demonstrates that both are central to the moral world of Austen’s novels. Writers must decide for themselves whether the care and feeding of a family distracts them from writing, or nourishes their creative lives. But food in fiction will continue to fascinate both readers and writers. Maggie Lane’s Jane Austen and Food entertains us with a wealth of information about historical context, and makes a compelling argument for the moral significance of food in art as well as in life. Sarah Emsley is the author of Jane Austen’s Philosophy of the Virtues and the editor of Edith Wharton’s novel The Custom of the Country. She lives in Halifax, Nova Scotia and is currently working on a novel. She spent two years as a postdoctoral fellow at the Rothermere American Institute, University of Oxford, and later taught classes on Jane Austen in the Writing Program at Harvard University. She blogs about Austen and Wharton at www.sarahemsley.com, and to celebrate the 200th anniversary of Mansfield Park in 2014, she’s hosting a conversation about the novel on her blog, with guest posts by Juliet McMaster, Laurel Ann Nattress, Syrie James, Lynn Shepherd, Margaret C. Sullivan, Deborah Yaffe, Devoney Looser, and many other wonderful writers. Follow Sarah on Twitter (@Sarah_Emsley), visit her on Facebook (https://www.facebook.com/sarahlbemsley), and subscribe to the blog to receive updates about this exciting celebration. This review orginally appeared on Austenprose.com and is used here with permission. Hot suppers are not much in use where people dine very late. When required, the top and bottom, or either, may be Game. Fowls. Rabbit. Boiled Fish, such as Soles, Mackerel. Oysters stewed or scalloped. French Beans. Cauliflower, or Jerusalem Artichokes, in white Sauce. Brocoli with Eggs. Stewed Spinach and ditto. Sweetbreads. Small Birds. Mushrooms. Potatoes. Scallop, &c. Cutlets. Roast Onions. Salmagundy. Buttered Eggs on Toast. Cold Neat’s Tongue. Ham. Collared things. Hunter’s Beef sliced. Rusks buttered, with Anchovies on. Grated Hung Beef with butter, with or without Rusks. Grated Cheese round, and Butter dressed in the middle of a plate. Radishes ditto. Custards in glasses with Sippets. Oysters cold or pickled. Potted Meals. Fish. Birds. Cheese, &c. Good plain Cake sliced. Pies of Bird, or Fruit. Crabs. Lobster Prawns. Cray-fish. Any of the list of sweet things. Fruits. A Sandwich set with any of the above articles, placed a little distance from each other on the table, looks well, without the tray, if preferred. The lighter the things the better they appear, and glass intermixed has the best effect. Jellies, different coloured things, and flowers, add to the beauty of the table. An elegant supper may be served at a small expense by those who know how to make trifles that are in the house form the greatest part of the meal. The Hereford Bull was undoubtedly a common sight in Austen’s Day. Exports of this breed began in 1816. The word “pomander” originates from the French “pomme d’ambre.” A common interpretation of this phrase is “apple of ambergris,” referring to the wax substance used as a base in pomander recipes. Others take the phrase to mean “apple of amber” or “golden apple,” as in the fragrant citrus fruits exchanged during holidays for good luck. The pomander became popular during the Middle Ages when the black death and other ailments ran rampant. Sanitation during the era was lamentably lacking. The streets and even some homes were strewn with filth, bodily fluids and the discarded remnants of past meals. People thought that the cause of their problems lay in the resulting stench lingering about the city. The belief went that the pleasant scent of a pomander could repel the disease in the air. Several recipes for pomanders survive from the era. To the base of ambergris, musk, civet, rose water, and other perfumes and spices were added. The mix would then be inserted into the pomander’s container. A pomander could be worn around the neck or waist. Many women attached them to their girdle. Both men and women wore pomanders, most of whom hailed from the elite classes of society. Queen Elizabeth I is frequently depicted wearing one, as are other nobles and notables of the day. People took great pride in their pomanders. Simple pomanders were made of wood, while the most stunning examples were worked in silver or gold, studded with precious stones, and etched with intricate designs. Some pomanders were divided into sections, similar to an orange, into which its wearer would place several different scents. The following illustration was provided by Stephanie Locsei of http://www.homemade-gifts-made-easy.com/. 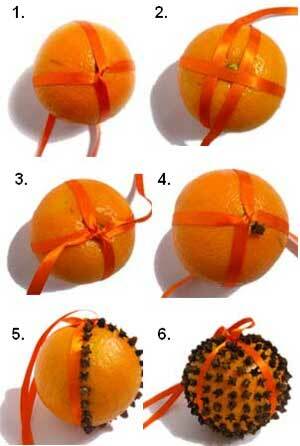 To complete this project, you’ll need an orange, enough narrow ribbon to wrap twice around your orange and tie in a loop, and a jar of whole cloves. As the following directions were intended for the conduct of the families of the authoress’s own daughters, and for the arrangement of their table, so as to unite a good figure with proper economy, she has avoided all excessive luxury, such as essence of ham, and that wasteful expenditure of large quantities of meat for gravy, which so greatly contributes to keep up the price, and is no less injurious to those who eat than to those whose penury obliges them to abstain. Many receipts are given for things, which being in daily toe, the mode of preparing them may be supposed too well known to require a place in a cookery-book; yet how rarefy .do we meet with fine melted butter, good toast and water, or well-made coffee! She makes no apology for minuteness in some articles, or for leaving others unnoticed, because she does not write for professed cooks. This little work would have been a treasure to herself when she first set out in life, and she therefore hopes it may prove useful to others. In that expectation it is given to the Public; and as she will receive from it no emolument, so she trusts it will escape without censure. Now regarded as the first “Domestic Goddess“, predating the perennial favorite, Isobella Beeton, by nearly a century, Mrs. Rundell modestly claimed that her book was not only essential to the “modern” middleclass housewife (rather than “professed cooks”– note, the difference that a generation makes here between this Hannah Glasse’s 1747 work, which was directed at servants: “…few servants there are, that know how to roast and boil to perfection. I do not pretend to teach professed cooks, but my design is to instruct the ignorant and unlearned (which will likewise be of great use in all private families) and in so plain and. full a manner, that the most illiterate and ignorant person, who can but read, will know how to do every thing in cookery well.”) but a gift to the public. She filled it’s pages with recipes for everything from “Good” Coffee to Bubble and Squeak, along with copious notes about servants, ‘There is a great deal of time, precious to their families, wasted by well meaning and virtuous women in running after charitable institutions, whilst their children are suffering from neglect, or abandoned to neglectful servants…’ to healthy eating, ‘We all of us, and at all times, consume more food than health or prudence would warrant. What gives trouble to one man to digest would maintain three in comfort’, to maintaining linens and setting your table. RUNDELL, Mrs. MARIA ELIZA (1745–1828), writer on cookery, born in 1745, was only child of Abel Johnstone Ketelby of Ludlow, Shropshire. She married Thomas Rundell, partner of the eminent firm of Rundell & Bridges, silversmiths and jewellers, which was long established on Ludgate Hill, London. The firm supplied snuff-boxes to the value of 8,205l. 15s. to foreign ministers at the coronation of George IV (Gent. Mag. 1823, ii. 77). While living at Swansea in 1806 Mrs. Rundell collected various recipes for cookery and suggestions for household management for the use of her married daughters. She sent the manuscript to the publisher, John Murray (1778–1843) [q. v.], of whose family she was an old friend. He suggested the title ‘Domestic Cookery,’ had the work carefully revised by competent editors, among whom was Dr. Charles Taylor, of the Society of Arts, and added engravings. It was published as ‘A New System of Domestic Cookery’ in 1808, and had an immense success. From five to ten thousand copies were long printed yearly. It became one of Murray’s most valuable properties, and in 1812, when he bought the lease of the house in Albemarle Street, part of the surety consisted of the copyright of the ‘Domestic Cookery.’ As the earliest manual of household management with any pretensions to completeness, it called forth many imitations. In 1808 Murray presented Mrs. Rundell with 150l. She replied, ‘I never had the smallest idea of any return for what I considered a free gift to one whom I had long regarded as my friend.’ In acknowledging a copy of the second edition, Mrs. Rundell begged Murray not to think of remunerating her further, and in the preface to the edition of 1810 she expressly stated that she would receive no emolument. But in 1814 Mrs. Rundell accused Murray of neglecting the book and of hindering its sale. After obtaining an injunction in the vice-chancellor’s court to restrain Murray from republishing the book, she in 1821 placed an improved version of it in the hands of Messrs. Longman for publication. Murray retaliated by obtaining an injunction from the lord chancellor to prevent Mrs. Rundell from publishing the book with any of his additions and embellishments. On 3 Nov. the lord chancellor dissolved the injunction against Murray, but gave right to neither party, declaring that a court of law and not a court of equity must decide between them (Gent. Mag. 1821, ii. 465). After long delay, Mrs. Rundell accepted Murray’s offer of 1,000l. in full discharge of all claims, together with a similar sum to defray her costs and expenses (cf. Moore, Memoirs, v. 118, 119). The book was translated into German in 1841; the sixty-fifth English edition appeared in the same year. Mrs. Rundell died, aged 83, at Lausanne on 16 Dec. 1828. Her husband predeceased her. Other books by Mrs. Rundell are: 1. ‘Domestic Happiness,’ 1806. 2. ‘Letters addressed to Two Absent Daughters,’ 1814. Laura Boyle runs Austentation: Regency Accessories. Her book, Cooking with Jane Austen and Friends, is available from the Jane Austen Centre Giftshop. Visit Austentation for a large range of custom made hats, bonnets, reticules and Jane Austen related items. A more detailed account of Mrs. Rundell’s life can be found at The Historic American Cookbook Project. Additional information can be found at the Cambridge Library Collection Blog. Jane Austen’s Blog – The wonderful world of Jane Austen as it happens. Jane Austen’s Blog is the place to come for the latest news and updates on all things Janeite, from new media releases to the latest happenings at the Jane Austen Festival, Centre, Regency Tea Rooms and Online Gift Shop.